Whether you want farm direct date fruit, dried fruit and nut gift baskets, or a local made food and wine gift, delicious flavors await with the Sphinx Date Co. Palm & Pantry Gift Catalog and coupon code. Since 1951 Sphinx has offered classic gifts of fresh, chocolate covered and stuffed dates - The date is said to contain everything a person needs for good health. 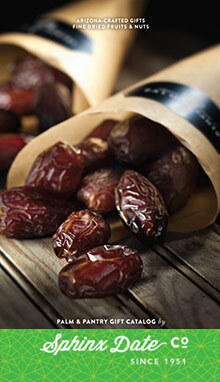 And the sweet and tasty locally grown Medjool date is the perfect choice for gifting. Choose from a variety of gift tins and trays of rich chocolate dipped, hearty stuffed with pecans or walnuts, or naturally sweet and delicious plain Medjool dates - direct from independent farmers. Food Gift Baskets - Send someone special one of their overflowing dried fruit and nut gift baskets with date fruit, dried apricots, local pistachios and more. Or, send a food gift basket with a variety of locally crafted pantry goods and Arizona wine. The perfect choice for a housewarming, congratulations or holiday treat. Locally Made, Artisan Crafted - Make every meal a little tastier with farm-fresh baking flours, home-style sauces, handmade sweets, regional specialties, flavorful salsas, spices and more. Choose from favorites like local made Olive Oil, Sphinx's own Date Salsas, or Prickly Pear candy - to Pancake Mix made from ancient, heritage grains or local raw honey. Sphinx has sweet and savory specialties for whatever your taste! Dried Fruits & Gourmet Nuts - Sphinx Date Co. has a large assortment of dried fruits and raw and roasted nuts, including dried figs, apricots, Arizona pistachios, pecans, bulk cashews, trail mixes, and more. Choose them for snacking, baking or as part of your favorite recipes. From the elegance of stuffed Medjool dates to pure Arizona honey to the spice of a Southwestern salsa, you'll enjoy the many tastes of family owned Sphinx Date Co Palm & Pantry. Located in Scottsdale, Arizona since 1951.